Knee conditions That may be affecting you! Results for patients with Osteoarthritis with Lack of Joint function. Patients value getting back to the activities they love, whether that is walking, running, skiing, or high-level sports. Prior to treatment, patients report that they are limited to 53% of their optimal function. After receiving treatment, they report averages up to 77%. The functional questionnaire represented here is the Lower Extremity Functional Scale (LEFS). The number of patients reporting at these time-points are: 4374, 2359, 3387, 3228, 2713, 2020, 1619, 915, 473. A main priority of Regenexx® is to decrease joint pain. Prior to receiving treatment, patients report average pain of nearly 5/10. After only 1-month, pain levels decrease to an average of 2.4/10, a decrease of 49%. Pain levels decrease further over time. The questionnaire used is the Numeric Pain Scale (NPS). The number of patients reporting at these time-points are: 4971, 2387, 3417, 3260, 2734, 2034, 1621, 920, 476. 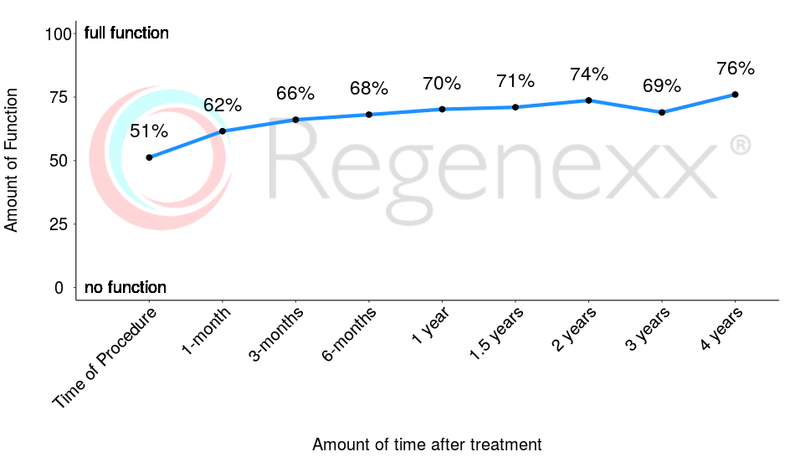 Patients feel their joints are already 37% better after only 1-month, and continue to improve from there. The questionnaire used is the Single Assessment Numeric Evaluation (SANE). The number of patients reporting at these time-points are: 2452, 3464, 3327, 2811, 2100, 1658, 930, 480. Patients value getting back to the activities they love, whether that is walking, running, skiing, or high-level sports. Prior to treatment, patients report that they are limited to 58% of their optimal function. After receiving treatment, they report averages up to 88%. The functional questionnaire represented here is the Lower Extremity Functional Scale (LEFS). The number of patients reporting at these time-points are: 221, 141, 173, 140, 87, 69, 59, 35, 26. A main priority of Regenexx® is to decrease joint pain. Prior to receiving treatment, patients report average pain of nearly 4/10. After only 1-month, pain levels decrease to an average of 1.9/10, a decrease of 49%. Pain levels decrease further over time. The questionnaire used is the Numeric Pain Scale (NPS). The number of patients reporting at these time-points are: 230, 142, 174, 141, 87, 69, 59, 35, 26. The number of patients reporting at these time-points are: 141, 173, 140, 88, 69, 59, 35, 27. Patients value getting back to the activities they love, whether that is walking, running, skiing, or high-level sports. 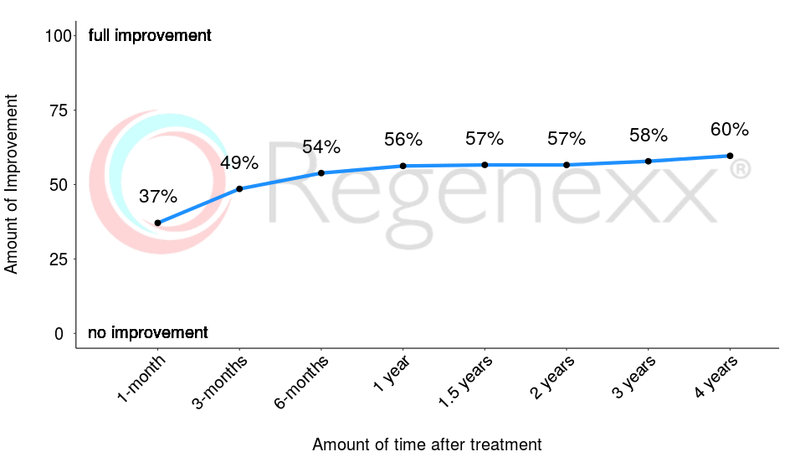 Prior to treatment, patients report that they are limited to 51% of their optimal function. After receiving treatment, they report averages up to 76%. The functional questionnaire represented here is the Lower Extremity Functional Scale (LEFS). The number of patients reporting at these time-points are: 413, 214, 327, 295, 239, 177, 134, 71, 45. A main priority of Regenexx® is to decrease joint pain. Prior to receiving treatment, patients report average pain of nearly 5/10. After only 1-month, pain levels decrease to an average of 2.5/10, a decrease of 46%. Pain levels decrease further over time. The questionnaire used is the Numeric Pain Scale (NPS). The number of patients reporting at these time-points are: 475, 216, 330, 295, 241, 181, 135, 72, 46. The number of patients reporting at these time-points are: 214, 330, 298, 241, 181, 137, 72, 48.